The Standard Nigerian English is a variety of the English language spoken in Nigeria by educated Nigerians. It is based on the Standard British English but contains some lexicons and similar sentence pattern of the American English due to the increasing contacts of Nigerians with Americans in recent times. It has its local flavours or spices which distinguish it from the British English. It is termed "standard" because it is generally acceptable in the Nigerian context as it is sometimes used by Nigerian media and creative writers (e.g. Wole Soyinka, Chinua Achebe, Chimamanda Adichie etc.) to express their world view. To back up this claim, Ekpe (2007, p. 78) asserted that "...the Nigerian English is an evident that English in Nigeria is now widely seen as an indigenous language with acceptable local features." However, such acceptability is limited to a certain degree since its use in formal writings is still frowned at. This might be as a result of the existence of a more standard variety known as the British English. Unlike the Standard Nigerian English, this variety enjoys international intelligibility, i.e., it is understood by all English speakers across the globe. 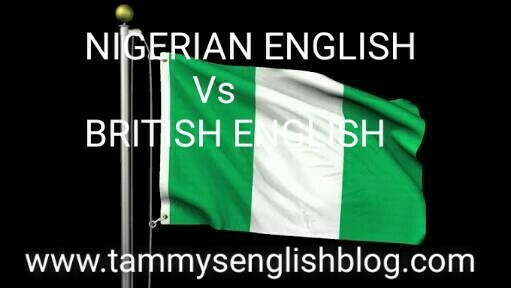 Therefore, it is advisable that Nigerian speakers of the English language should be abreast of the workings of the British English and use it always or when necessary. 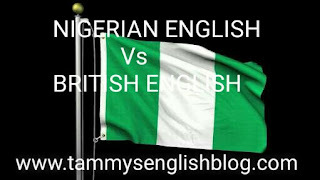 Having said that, let's take a look at some Nigerian English expressions and their standard forms (British English). Me I can’t take it (the use of “me” together with “I” in the subjective case). You are doing that at your own detriment. The principal is not on seat. The principal is not in his office. The president casted his vote yesterday (often used on print media). The president cast his vote yesterday. I feel like licking orange. I feel like eating orange. The girl is doing eye service. The girl pays lip service. Where did you keep the torchlight? Where did you keep the torch? His father is a wealthy man. When are you returning/bringing back my book? When are you returning/bringing my book? Go and barb your hair. Go and have a haircut. I want to see you, sir (the speaker facing the person being addressed). Excuse me, sir. OR I would want to have a word with you, sir. Sir, I want to sign my course form. May you please append your signature on my form? Please, reverse your car back. You are called. OR Someone is calling you. Are you hearing the smell? Can you perceive the odour? I want to take my bath. He pays his rent as at when due. He pays his rent when due. I escorted her to the market. I accompanied her to the market. My head is paining me. She is my junior sister. She is my younger sister. It is high time I visit my parents. It is high time I visited my parents. You can’t eat your cake and have it back. The devil you know is better than the Angel you don't know. I am coming (whereas the person is leaving). Please, borrow me your pen. Please, lend me your pen. I will pay it (the debt) instalmentally. I will pay the debt by instalment. The cloth did not size her. The cloth is not her size. I am owing her money. I owe her some amount. She is good at English. He travelled in a luxurious bus. He travelled in a luxury bus. Cut your coat according to your size. He is a tout (whereas the speaker actually means “lout”). Please, don’t be in a hurry to leave. Which variety do you use? Is it Nigerian variety, British variety or both varieties? Just tell us using the comment box. You can as well add to the list. Thanks! Enter your comment... I need more light on 41. let's say there is a beggar that uses a particular junction often, but doesn't live there. How can this be presented?